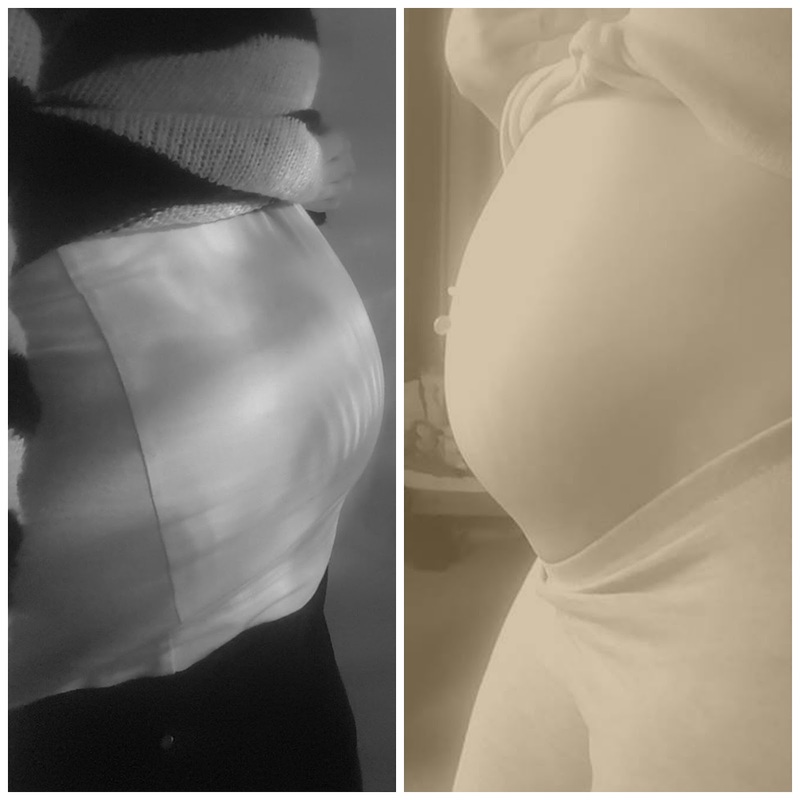 It's been a good few weeks since I entered my third trimester and now that time's ticking and it's not long before we'll be in the single digits on this weekly countdown I thought it was about time I gave an update of where I am and how I'm feeling within this pregnancy since my last update. I've not been updating or sharing the pregnancy with you as much as I'd of liked and apart from getting bigger I've felt relatively the same throughout, although I am feeling a lot more excited about the prospect of being a Mummy to a newborn again and not feeling kinda blue about the whole thing. Pregnancy Reveal and Gender Reveal are clickable links if you want to refresh your memory on my pregnancy so far. When I went to my 20-week scan I was told that my placenta was covering my cervix and this would have to be kept an eye on. I was also told due to my second baby being on the smaller side I'd have to have growth scans throughout the last few months of my pregnancy in case this was down to something more serious and could be prevented. I actually had my first growth scan this week and in having the scan they were able to tell me how I was getting on with my placenta covering part of my cervix and whether it had moved or not. Good news on both fronts really. Baby is within the measuring guidelines but on the lower side of those measurements and therefore I do have to go back for a growth scan earlier than expected to make sure it goes up rather than stay on the same line else I'll fall below those measurements. The placenta has moved up away from my cervix and the baby's head was actually down with the placenta placed behind her. They are still being cautious about the placenta and although it's unlikely to move back and cover my cervix again they still want to give me the planned internal for the end of February. I'm so happy this is the case and the placenta did move because after reading up online about the stuff that could happen if the placenta didn't move was worrying and slightly scary. During the growth scan I was told the water around the baby wasn't at the recommend level and was lower than it should be and this ended in me being tested on the off chance I'd started losing water, thankfully it wasn't the case and I'm just more baby and not much water, which is what I've been saying for quite some time. My iron level is also low and I'm now on tablets to get it to the recommended level. Honestly, I've found this pregnancy to be the hardest out of all my pregnancies. I've found it to be quite exhausting and because of the lack of water I'm literally feeling every movement and this leaves me with the worst period type pains. I spoke to my midwife who explained this could be early Braxton hicks or my uterus expanding. Don't get me wrong, I love feeling the baby move, but it can just be quite achy and exhausting at times. I'm super tired and have very little energy, although I do try to push myself to get stuff done and constantly running around after my 2 other children. I don't sleep very well during the night and struggle to get comfortable. There are only a few positions I can lie in and even those can take there toll after a while. Baby now weighs 1.2kg and is 28cm. I'm currently 29 weeks and 3 days and honestly, it's going by so quickly. I'm not far off having bought everything and I've even started purchasing some bits and pieces in ages 3-6 months. I've got a list of bits and pieces of stuff that I'd like and between the baby Daddy and his Mum they've kindly decided to purchase the rest. My Mum and Step-Dad also very kindly bought the pram and it's gorgeous. Although I am due early April I can't help but think she's definitely going to be a March baby. I'm now anticipating her arrival, although a little early yet because she needs to grow loads more, but I'm ready for her - the hospital bag just needs packing. If anyone's interested I'll be sure to do a What's In My Hospital Bag - Baby Edition. I'll also be doing a final update towards the back end of February to early March.